The original motte and bailey is now known as Hen Domen and was built at the order of Roger de Montgomery, Earl of Shrewsbury, sometime between 1071 and 1074. On the rebellion of his son Robert of Belleme in 1102, the castle was given to Baldwin de Boulers. It is from Baldwin that Montgomery gets its Welsh name, Trefaldwyn (Baldwin's town). The de Boulers (later known as Bowdler) family held the castle until 1215, when the fortress was destroyed by Prince Llywelyn ab Iorwerth. The motte and bailey was subsequently refortified as an outpost for the new stone castle and probably survived until around 1300. The rebuilding of Montgomery Castle in stone was commenced in the late summer of 1223 on the 16th birthday of Henry III of England, a mile to the south-east of the original site. The architect of the new castle was Hubert de Burgh, who also rebuilt Skenfrith Castle, Grosmont Castle and White Castle in the Welsh Marches. From 1223 until 1228 masons worked solidly building the entire inner ward, or donjon as it was then known, on a great rock above the later town of Montgomery. This work consisted of the gatehouse, two D-shaped towers and the apartments which crowded around the curtain wall of the inner ward. After an unsuccessful attack by Prince Llywelyn ab Iorwerth in 1228, the middle and outer wards were added to the castle. The castle was again attacked in 1233, which resulted in damage to the well tower, which had to be subsequently repaired and re-roofed. 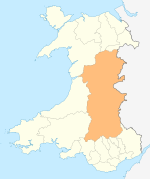 Montgomery was granted a Royal Charter by the king in 1227, making it the oldest borough in Wales. In 1267 Montgomery was the meeting place for treaty negotiations, where King Henry III granted Llywelyn ap Gruffudd the title of Prince of Wales. Fifteen years later, in December 1282, the army of Montgomery marched from here to Builth Wells to surprise and kill Llywelyn. After 1295 and the final Welsh War of the thirteenth century, the castle became more of a military backwater and prison than a front-line fortress. 270° panorama inside the ruins of the Montgomery Castle, Montgomery, Wales. This panorama shows the castle walls and grassy interior courtyards as well as views of the Welsh countryside as seen on a rainy October afternoon. 360° panorama of Montgomery and the Montgomery Castle, Wales. This panorama shows the castle overlooking the town as well as views of the Welsh countryside as seen on a rainy October afternoon. The walled town of Montgomery was attacked by the Welsh forces of Owain Glyndŵr in 1402 and sacked and burned. However, the stone castle fortress held out against the attack. Though the garrison was not large, the design and the men inside did their job. The town walls were not rebuilt, and the town remained a ruin for two whole centuries. The town walls have now all but disappeared over the intervening centuries, but the town ditch remains. In September 1644 the 1st Baron Herbert of Chirbury surrendered the castle to Parliamentary troops in the Civil War. It was later demolished by order of the Parliament in June 1649 who had referred the matter to the Council of State, despite the plea against demolition by Richard Herbert, the succeeding eldest son of the late Lord Herbert of Cherbury who had died the previous year. The 2nd Baron, the last Herbert to have lived at Montgomery Castle, was buried at Montgomery in 1655. There are permanent exhibitions relating to the medieval Hen Domen and Norman Montgomery Castles and their archaeological excavations with scale models of both in The Old Bell Museum, Montgomery, Powys. The Old Bell Museum, Montgomery, Powys. Wikimedia Commons has media related to Montgomery Castle. This page was last edited on 18 January 2019, at 21:10 (UTC).